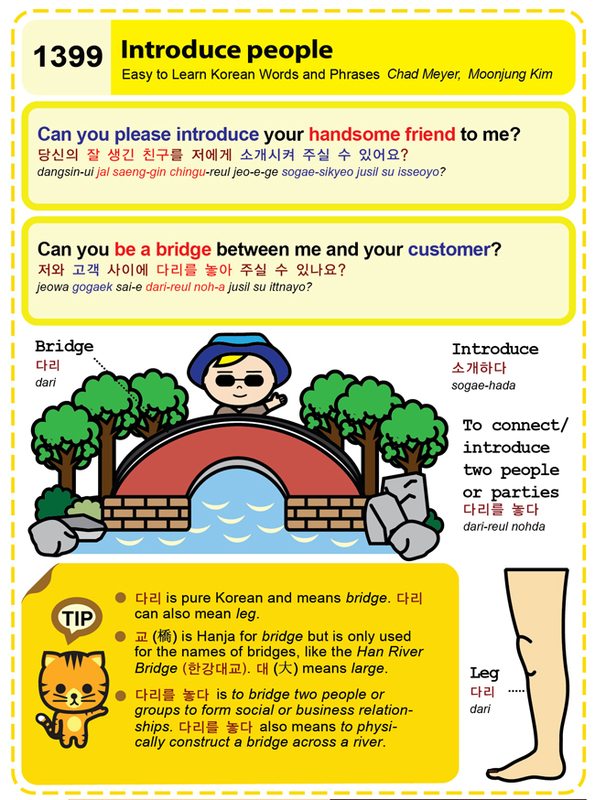 Easy to Learn Korean 1399 – Introduce people. This entry was posted in Series and tagged big, bridge, bridge two people or groups to form social or business relationships, Can you build a bridge between me and your customer?, Can you please introduce your handsome friend to me?, Han River Bridge, introduce, large, leg, physically construct a bridge across a river, to bridge two people or groups to form social or business relationships, To connect/ introduce two people or parties, 大, 橋, 교, 다리, 다리를 놓다, 당신의 잘 생긴 친구를 저에게 소개시켜 주실 수 있어요?, 대, 소개하다, 저와 고객 사이에 다리를 놓아 주실 수 있나요?, 한강대교 by easykorean. Bookmark the permalink.